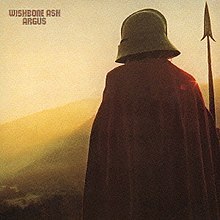 Argus is the third album by the rock band Wishbone Ash. It is their most commercially and critically successful album. It peaked at No. 3 in the UK Albums Chart. The album is medieval-themed, featuring a blend of progressive rock, folk, and hard rock, and is considered a landmark album in the progression of twin-lead guitar harmonisation later adopted by bands such as Thin Lizzy and Iron Maiden. The sound engineer on Argus was Martin Birch, who also worked with Deep Purple, later with Black Sabbath, Iron Maiden and other hard rock bands. The bulk of the lyrics were provided by bassist/lead vocalist Martin Turner, although all members are credited with the music and arrangements. In 2002, an expanded CD was released, featuring a remix (by Martin Turner) of the original album as well as the three live tracks from the EP Live from Memphis promotional EP, recorded in the studios of WMC-FM. In 2007, a deluxe edition was released. This included the 1972 mix as well as additional BBC Session tracks. In 2008, Martin Turner released a new studio recording of Argus. Wishbone Ash released a live version of the album entitled Argus "Then Again" Live. All songs composed by Wishbone Ash. ^ "Wishbone Ash - Argus (album review ) - Sputnikmusic". Sputnikmusic.com. Retrieved 15 September 2018. ^ Ruhlmann, William (8 May 1972). "Argus – Wishbone Ash : Songs, Reviews, Credits, Awards". AllMusic. Retrieved 9 November 2012. ^ Roberts, David (2006). British Hit Singles & Albums (19th ed.). London: Guinness World Records Limited. p. 607. ISBN 1-904994-10-5. ^ "Wishbone Ash – Argus (Vinyl, LP, Album) at Discogs". Discogs.com. Retrieved 8 November 2012. This page was last edited on 28 October 2018, at 18:10 (UTC).